Hi, everyone, Barbara here with a card for your today. Sadly, I recently needed a sympathy card and this is what I came up with. For my card base I'm using some of my favorite patterned papers, Lost & Found Two – Rosy by MME. I stitched around my base card and then sponged the edges with Antique Linen Distress Ink and my Inkssentials Foam Blending Tool. 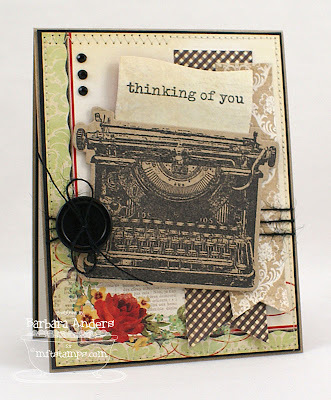 Then I stamped the typewriter image and sentiment with Memento Tuxedo Black ink and popped it up on foam tape. I added some twine, a button, and some sweet Kaiser Craft self adhesive black rhinestones. OK, that's it for me today. Hope everyone has a happy and safe weekend! Great card, Barbara! I hate to admit it but I've used one of those typewriters before! !